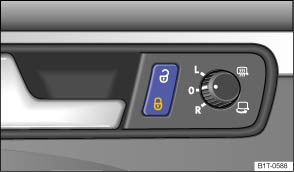 The central locking button works when the ignition is switched on and when it is switched off. The deadlock mechanism will not be activated . The doors can be unlocked and opened from inside by pulling the door release handle. You may have to pull the door release lever more than once. If the driver door is open, it will not be locked. This prevents you from locking yourself out of the vehicle. The vehicle will unlock automatically once the vehicle has come to a standstill and the vehicle key has been removed or the button is pressed.